Asia’s buoyant economic growth rates have led to the emergence of a large middle class which includes working women and more and better educated young people who want peace and prosperity, not conflict. These positive developments are part of the new reality that needs to be shared and discussed. Britain’s noisy, self-destructive withdrawal from the EU will dominate this week's agenda. But EU-watchers should also pay attention to the compelling geopolitical story to be played out at the Asia-Europe Meeting (ASEM) in Brussels. Asia and Europe are in the midst of rapid political, economic and societal change. Both regions are being tested by zero-sum games, economic nationalism, the spread of illiberal values, destabilisation provoked by fake news and violations of the rule of law and human rights. Climate change, rapid urbanisation, economic and social inequalities remain a challenge. Yet, Asia and Europe are also buzzing with new ideas, constructive initiatives and technological innovations aimed at building a better world. ASEM has been around since 1996 when far-sighted Asian and European politicians – from Singapore, France and Germany – decided it was time to step up their political and economic engagement. Asia-Europe relations have been up and down since then. The excitement of new beginnings in evidence at the first ASEM summit in Bangkok dissipated over the years. Policymakers in both regions stayed loyal to the cause but their political bosses got a bit bored. It required so much effort. Leaders started skipping ASEM Summits. They did not like how tedious the once spontaneous exchanges at such meetings had become. ASEM statements were long and achingly boring. Bureaucracy ruled. Creativity went into hibernation. No longer. ASEM has a new spring in its step and it is partly thanks to America, rising China and also the new spotlight on Europe as a possible guardian and guarantor of international law and cooperation. Reluctantly at first but now with more enthusiasm, Europeans are seeking to wean themselves off their over-dependence on the US. Similarly, after years of stalemate, and despite continuing rivalries and competition, Asia’s top leaders appear to be getting serious about trying to patch up relations and sidestep long-standing animosities. The American security umbrella in the Asia Pacific is still seen as important. But in many subtle, hesitant, non-headline-grabbing ways, governments in the region are starting to prepare for a new post-US era. Europe and Asia are also being impacted by the rise of China. Once a relatively passive ASEM member, China is now an unabashed agenda-setter and has pushed successfully to put "connectivity" at the heart of ASEM deliberations. That's not surprising given China's widening global outreach and the fact that almost all ASEM members are impacted in one way or another by President Xi Jinping’s ambitious Belt and Road Initiative (BRI). The EU is being challenged by the BRI both at home and abroad, not least in the Western Balkans. It is in Asia, however, that the BRI has its most prestigious projects – and an uncertain future as China's ambitious vision clashes with complex on-the-ground realities. Pakistan, widely viewed as an obedient and unquestioning friend of China, is beginning to have second thoughts about some projects being implemented as part of the China-Pakistan Economic Corridor. Governments in Malaysia, Myanmar and Sri Lanka are engaged in similar self-reflection. India, while unhappy with several aspects of the BRI, is not at all anxious to endanger its fragile friendship with China. And while it was initially opposed to the BRI, Japan has now voiced a readiness to cooperate with China on the BRI. 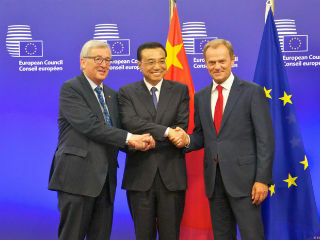 For Asian and European leaders who are seeking to stay outside the crossfire of worsening US-China relations, the EU's recently-unveiled connectivity strategy, as well as the sustainable connectivity index crafted for ASEM, offer a way forward. With its focus on “sustainable, comprehensive and rules-based connectivity” and projects which comply with international environmental, labour and fiscal standards, the EU's connectivity blueprint provides ASEM countries with a useful rulebook on how best to negotiate and implement BRI and other connectivity projects. There are other challenges for ASEM to tackle, including reform of the World Trade Organization and keeping the Paris climate agreement and the Iranian nuclear deal on track. Set up in a more innocent, less-charged and less-contested era, ASEM must now prove that it can respond to a more challenging world – and that Asia and Europe can continue to work together despite their differences. It's not going to be easy. But nobody said living in Trump's world was a walk in the park.